Our civilisation is becoming painfully aware of what has always been known to a few. The universe is endless. Or even if our universe is not endless, there are other universes behind it. Because of this your exact situation in every way will exist in countless copies throughout eternity. And not only in copies, but every single point in time, past or future. And in every variation imaginable or unimaginable. This makes time and space irrellevant, it makes life itself irrellevant. It makes sure that even the smallest thought you ever had was already there before you thought it. Meal you cook had already been cooked an infinite amount of times. It all gathers into the point of everything, where there are no surprises and all is contained. Because of this, every event can be forseen and every event remembered. But there is no point, as it was already decided. Any kind of control is thus useless, all imagination is as real and existant as much as we believe we are. We are all living absolutely every situation of eternity always. Someone out there knows that he is you. Like an endless stream of mirror images of sentient beings, but not only mirrored. They vary to every possible form. This makes us all one and all without consequence. Death is an impossibility and life is an illusion. All we can do is to play this already played game. You will forget this every day; that has been foreseen. It was common amongst northern native groups to freeze their catches in big pieces over the winter. Meat was simply chopped off as needed. 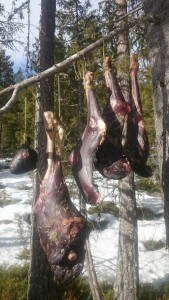 Especially in the milder parts of the boreal zone, the meat from autumn kills would ferment as the winter progressed. When the spring thawed out the meat piles, the remaining was dried in big pieces for summer use. At this time there are few flies, the air dry and the sun reflects strongly off the snow. Some groups used a light smoke or salting prior to the drying to keep flies and birds off. This method saves a lot of work compared to drying meat in summer when it has to be cut really thin and smoked continously to avoid spoilage. The latter method is the one I have largely been using until now. I could ideally have started drying the meat a bit sooner than I did. Night frosts are now not quite as hard and some flies have appeared. I used no salt or smoke and am looking forward to testing the results soon. The meat in the photo are the legs and heart of a wild reindeer.